Don’t judge anyone unless you have walked their path. Judging people comes easily to all of us. And at times we judge people about whose lives we have no idea. We just go with popular opinion – either agreeing or disagreeing with it – while passing judgments about such people. I believe each of us must develop a responsible and compassionate attitude towards others instead of being reckless or fickle. I have a confession to make. I am not a fan of Chetan Bhagat. Not because I have read his book(s) and ended up not liking what he wrote or his style. I simply chose to not be his fan because there were many I knew – some of whom had read his work(s) – who disliked him. My opinion of Chetan Bhagat was an acquired one and not based on personal experiences or preferences. This opinion was acquired way back in the 2004~2005 timeframe when Five Point Someone was released. I was definitely not as evolved as I am today, back then. I have never read Five Point Someone, till now, though I understand (having been told so by some of his die-hard fans) that it is Bhagat’s finest work to date. Over the years, even as Bhagat’s stature and popularity grew immensely, somehow I preferred to ignore every time Bhagat the person, his work, or his columns, popped up around me – on TV, in the papers, in social conversations, on social media and such. “Chetan Bhagat, no, thank you,” would be my sub-conscious, even pre-meditated, response each time. And then, this week, the latest issue of India Today hit me! I have worked for the magazine in the 90s and I know that if my former boss, and India Today Editor-in-Chief, Aroon Purie, clears a story to go on the cover, it – the subject or the person – has to have some serious merit. The magazine has changed a lot since I left the India Today Group in 1995, but I know it still stays rooted to some strong values and principles. 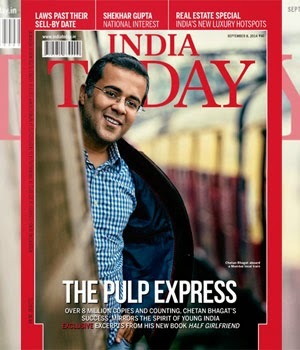 And what hit me this week is that Chetan Bhagat is on the magazine’s cover! I read the story written by Mini Kapoor completely. I am not going to comment on the quality of the story or the pictures or the layout. I am simply going to share what I learnt from it – from understanding Bhagat’s Life and his path to success as a writer, better. My learnings could not have come at a more opportune time. Just this past month, in August 2014, Westland published and released my first Book – “Fall Like A Rose Petal – A father’s lessons on how to be happy and content while living without money”. As a first-time author, I am trying to understand how publishing works, how the book trade works, how a book is distributed, what drives people to pick up a book, what kind of people read the kind of book I have written – these are just some of too many angles to consider while you work towards your book going out, reaching people, touching their lives and, hopefully, making a difference. Even as I am grappling with these aspects, I read Kapoor’s cover story on Bhagat in India Today. I just realized that in a decade-long career as a published author his books have sold eight million copies! I knew he was a banker who had kicked his white-collar job to follow his bliss as a writer, but I had never paused to understand why he did that. Now I know that it was a phase of darkness in his professional career that impelled him to write, to share and to express himself. I saw a parallel there to my Book’s birth – it came in the throes of our Firm’s bankruptcy and our personal cashless situation. I read his interview in the magazine and was impressed with his vision for being a change agent – by using his connect with young Indians, to invite them to be the change that we so urgently need to see in India. I could relate to his sentiments about changing India completely. Thanks to what I read, and what I internalized, my respect for Chetan Bhagat just went up several, several notches. I may perhaps never be his fan in that sense – because I don’t read fiction much. But I read the excerpt of Half Girlfriend, that India Today has carried, and I felt his story-telling is good and he caters to the reading-ability and the social sensitivity of his target audience well. I paused to reflect and ask myself why was I not willing to even consider Bhagat’s existence until now? And why this sudden transformation in my attitude towards him? That’s when I realized that I had just been swept by popular opinion and I had been, I must admit, judgmental. Without reason, without a personal experience. In my Book too, in the context of our Life, I have championed the need to stay away from judging anyone unless we have been on the same path that they are on. Only when I turned an author and got on to the road, on which Bhagat is several light years ahead, I realized how challenging his own journey must have been and I truly understood the value he has created for those people who have read his works. Every time an urge to judge someone or pass a random – often rabid – opinion arises in us, let us pause and ask ourselves – Do we know them? Do we know their story? Have we been on the same road, the same journey as them? Do we have a personal experience with them that substantiates the opinion that we are beginning to see form in us? This is one way I am learning to stop being judgmental about people. And at such times when I do have a personal experience driving my opinion, I still ensure that I keep my sentiments to myself or I share it with the person concerned. This is how, I believe, we can make our world a better place for all of us to live and thrive peacefully!